Portland, Maine. $5 1902 Plain Back. Fr. 600. The Portland NB. Charter #4128. PCGS Currency Gem New 65 PPQ.L.E. Ashton and Chas. 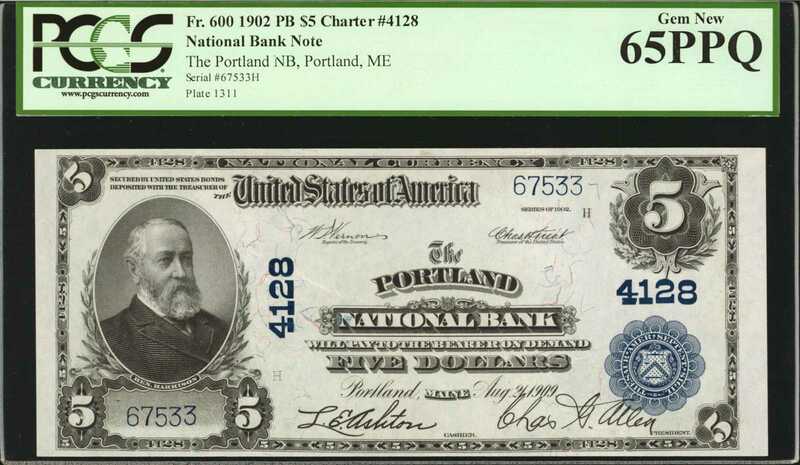 Allen were the officers who left their gorgeous signatures on this Third Charter note. It is as bright as a new fallen snow, showing deeply-contrasted printing that almost has a cameo effect. Huge margins and exceptional centering validate the assessment of the grading service. A simply unimprovable large size National.